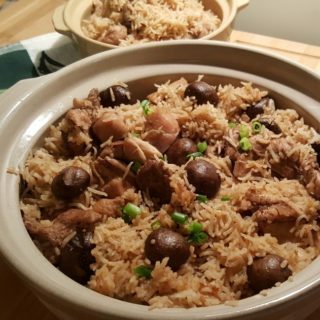 Pressure Cooker One Pot Chicken and Rice is an easy one pot meal. Freezing chicken with the marinade will free up your time for future meals. 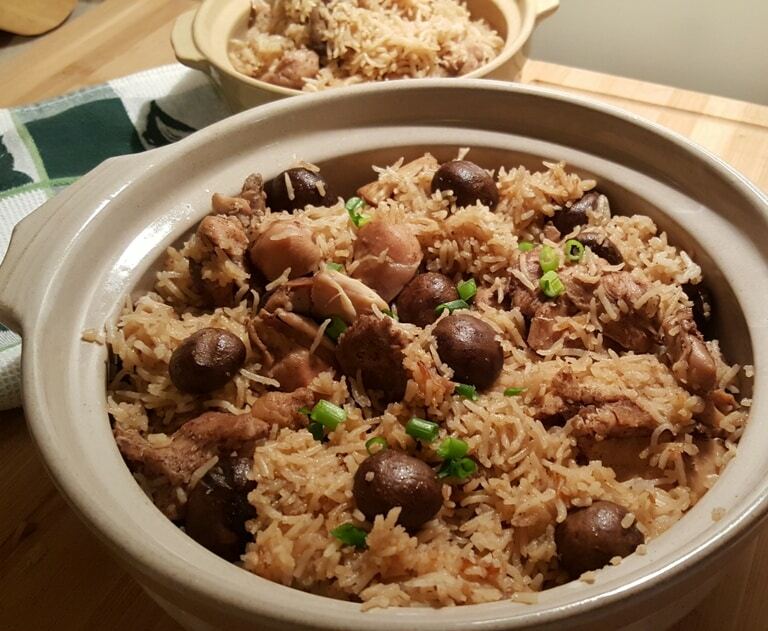 One of the most asked for recipes is Chicken and Rice cooked in the Pressure Cooker, in one pot, at the same time, with just one push of the button. You will be thrilled to learn that it is possible and it is very easy. You already know that I love making recipes completely by scratch and I love making Asian dishes using Asian sauces, spices and ingredients. Chicken thighs work really well in this recipe. My friend ワタナベ 聡, got me interested in using a Donabe (Japanese Hot Pot) for cooking. But, I love it so much, I like to use it as a serving piece too. ワタナベ 聡, presented me with this beautiful Donabe (Japanese Hot Pot) last year and asked me to use it in an easy Pressure Cooker One Pot Chicken and Rice. ワタナベ 聡 is from Japan and tells me that dark meat chicken is the most used in Japan. She also says that chicken must be marinated at least one day, to absorb the flavor. She is right! 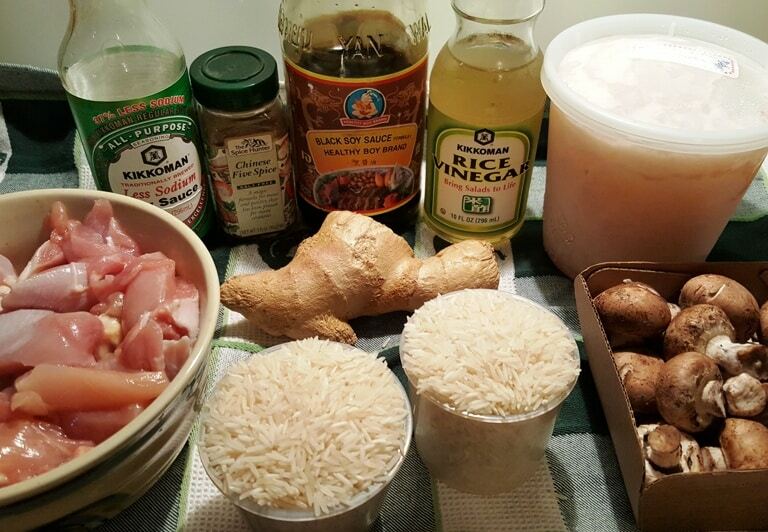 If you don’t have these ingredients on hand, I have just added a simple Pressure Cooker Mr. Yosida’s Chicken and Rice recipe to my blog, which is very similar to this recipe, but uses a bottled marinade. Chicken tastes better after it has been marinated for a day, so, a great trick for this dish and others that use a marinade), is to buy a bunch of dark meat chicken and cut it into large pieces. Take several freezer safe bags or containers and divide the chicken into family size servings. 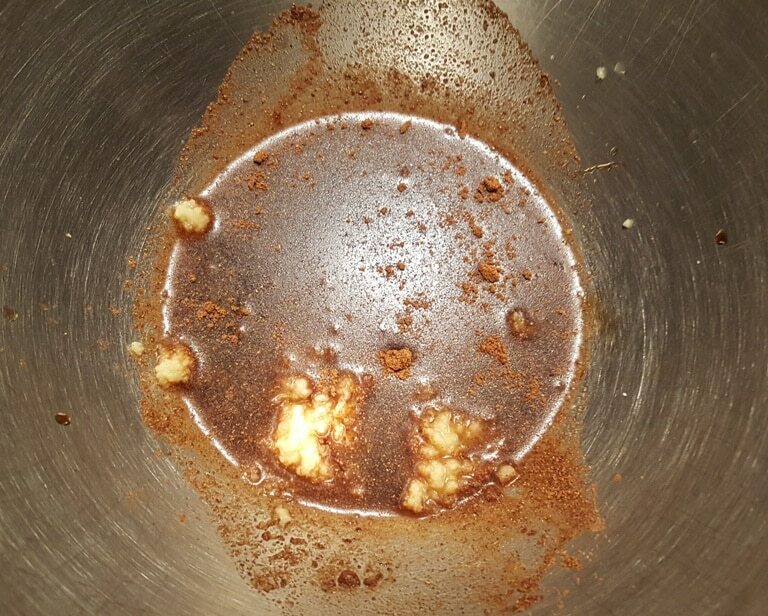 Add this homemade marinade, Mr. Yoshida’s Marinade, or your favorite marinade to the packages and pop them into the freezer. Then, all you have to do is take out a package of chicken the night before and pop it into a Mixing Bowl and allow it to defrost. This way, your chicken will have a nice long time to marinate. 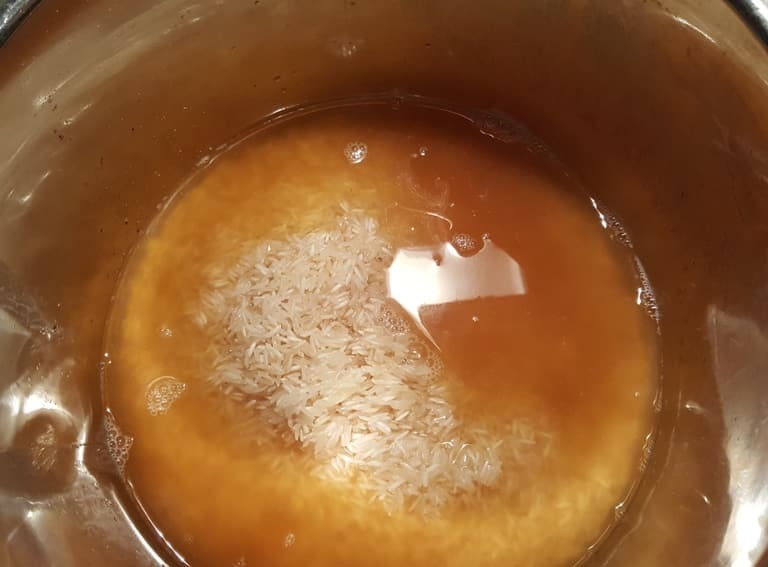 If you have just come here from my Pressure Cooker Mr. Yoshida’s Chicken and Rice recipe page, you will find this homemade marinade kind of tastes like the famous, Mr. Yoshida’s Marinade. Let’s begin by removing the skin, bones and fat from the chicken and cut the chicken into large chunks and place in a Medium Size Mixing Bowl. Set that aside and then we’ll make the marinade. 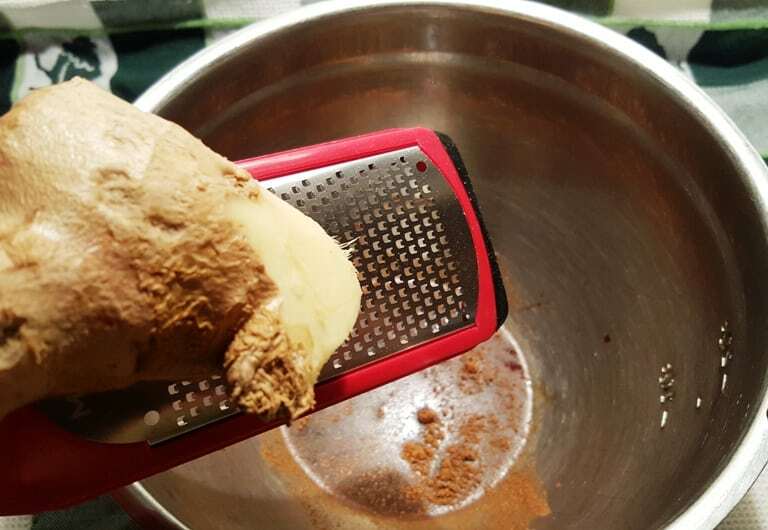 I like to use a Microplane Artisan Fine Cheese Grater to grate my fresh ginger. I use Sweet/Black Soy Sauce a lot in my recipes. If you cannot find it locally, you can always get it from Amazon. I also use Chinese Five Spice quite a bit. Don’t buy a large container as you only need a small amount. I think the rest of the ingredients are pretty easy to find locally. 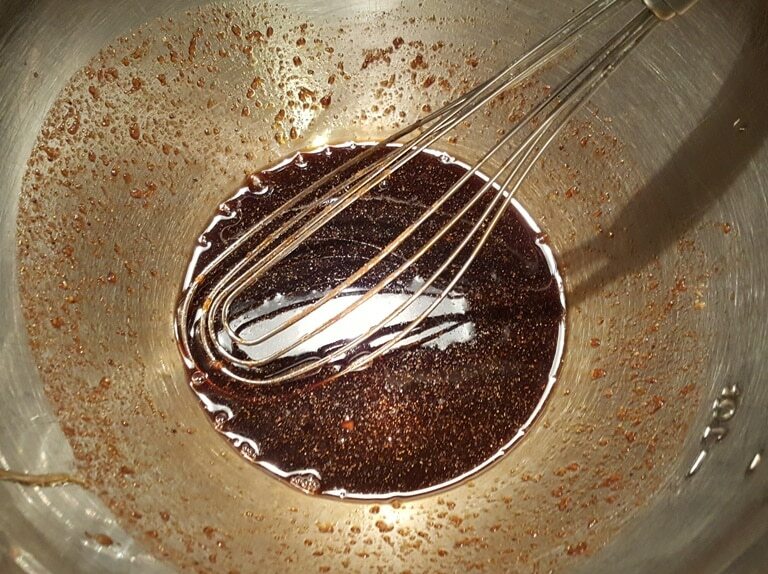 Whisk together all of the marinade ingredients. 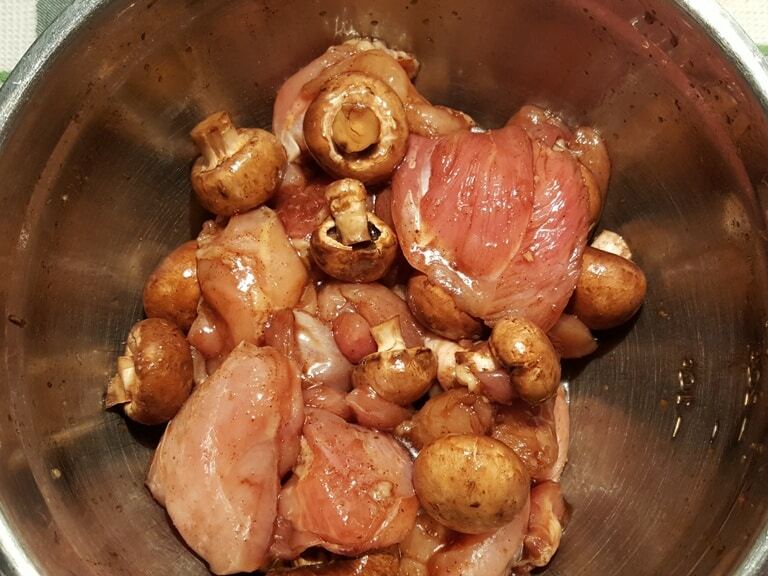 Then pour the marinade into the Bowl of chicken and mushrooms and allow the chicken and mushrooms to marinate in the refrigerator overnight, or at least 30 minutes. Since we are using a Pressure Cooker, the High Pressure will help to infuse the flavor into your chicken and into the rice! 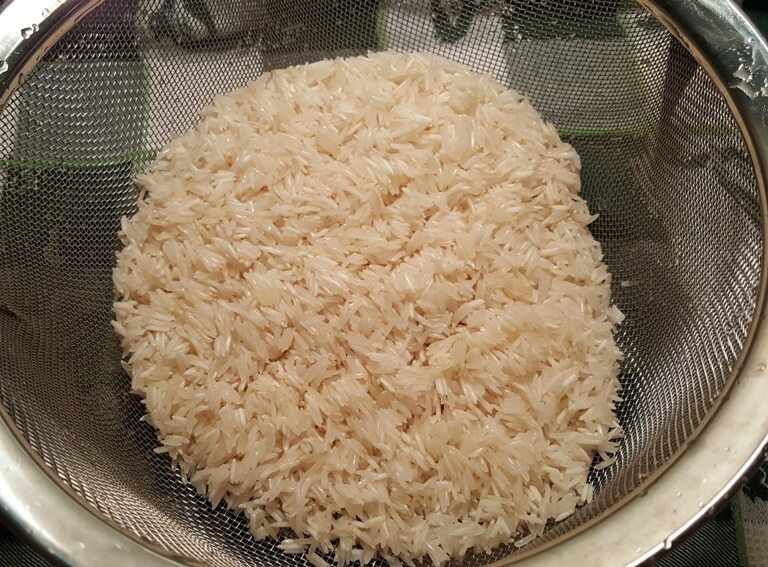 It’s always a good idea to wash your rice until the water runs clear. Just smush the rice around to scrub it clean. Toss it into your Pressure Cooker. A “rice” cup of rice is approximately 6 oz dry weight. It’s that little plastic cup that comes with pressure cookers and rice cookers. It is not the same as using a proper “measuring” cup, which measures in weights/ounces. A coffee cup can be any size, right? You would not use your favorite coffee cup to measure and assume it is a standard 8 oz dry or wet measuring cup. The coffee cup I use in the morning holds 10 oz of liquid. Okay, so, now you now. A “rice” cup is just that…a vessel for measuring rice. Add the chicken broth (or water) and mix it through the rice. Dump in the chicken/mushroom mixture, including the liquid and mix through. Shut the lid and set your Pressure Cooker. It’s that easy! 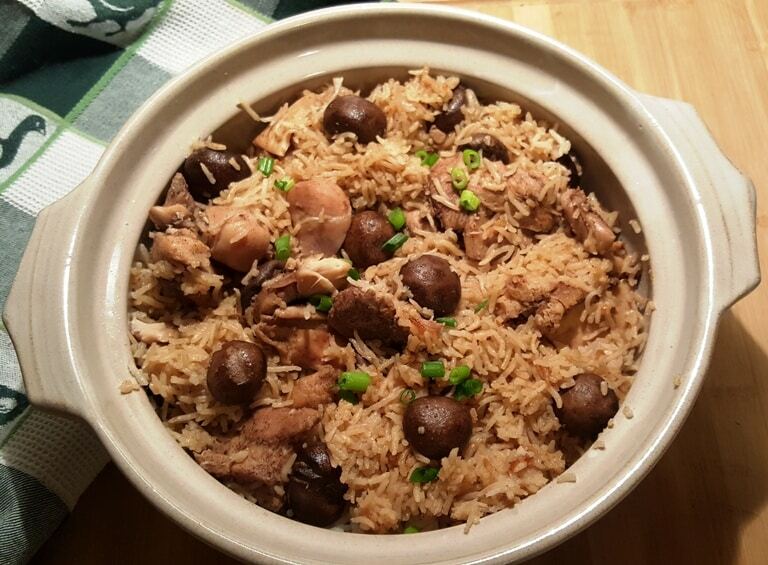 Perfectly cooked chicken in rice in just 6 minutes! Allow a 10-15 minute Natural Pressure Release. When you hear the beep, start getting your table ready for dinner. I love this Donabe (Japanese Hot Pot). It’s purpose is to be used on a burner at the table with a hot broth, meat and vegetables. Diners sit at the table and take what they want and if needed, more meat and vegetables are added. Noodles are added at the end, after the full flavor of the broth is formed. It’s a lot of fun! Please note: If you cut this recipe in half, please reduce the cook time to 3 minutes with a 10 minute Natural Pressure Release. 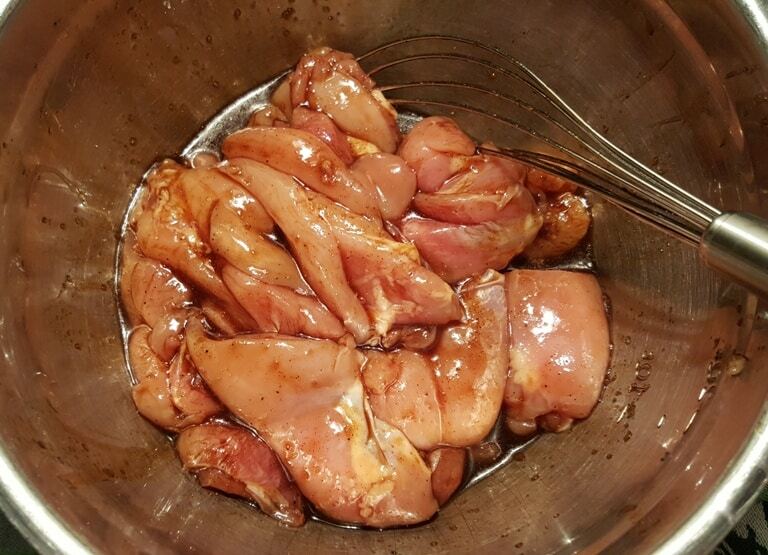 Remove fat from chicken and cut into large chunks and place into bowl. 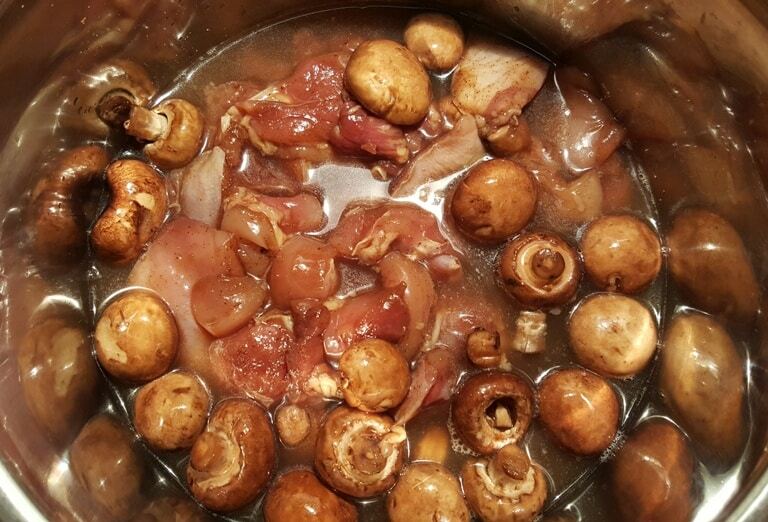 Add washed mushrooms. Whisk together marinade ingredients and pour over chicken and mushrooms and set in refrigerator overnight, or for at least 30 minutes. 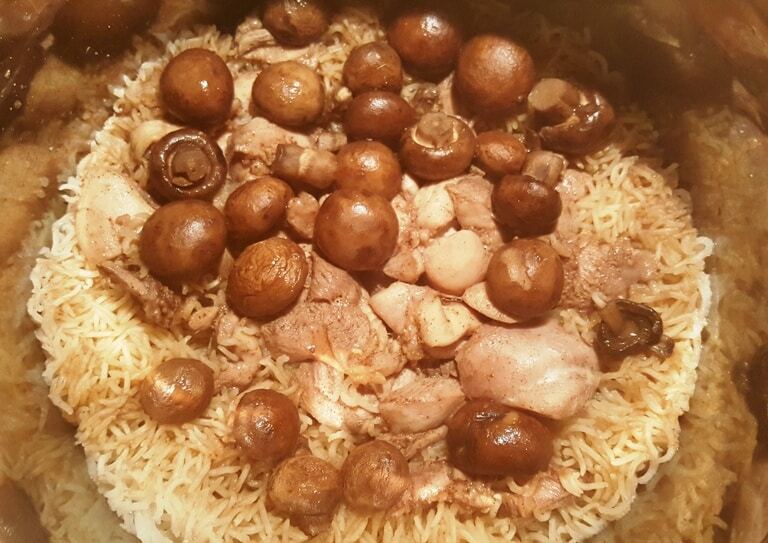 Add rice, broth and chicken/mushrooms to your Pressure Cooker cooking pot. Cook at High Pressure for 5 minutes. When Beep sounds, allow a 15 minute Natural Pressure Release. If you want less rice, use 2 "rice" cups of rice and 1.5 cups of broth or water. For chicken breasts, cut the chicken into larger pieces. If you cut this recipe in half, please reduce the cook time to 3 minutes with a 10 minute Natural Pressure Release. PIN this Pressure Cooker One Pot Chicken and Rice! Have you tried this with brown rice? I’m wondering how to adjust the liquid and cook time to make that work. Brown rice takes much longer to cook than white rice. You would need another 9 ounces of liquid, at least for the brown rice. You might want to partially cook the brown rice and then add in the chicken. Chicken cooks really fast. Thank you. I really like brown rice and I have been trying to figure out how to use brown rice instead. When you’ve prepared a double portion of this recipe and put it in the freezer, did you include the mushrooms also? That looks awesome, but hits both ends of my limitations with hubby and mom. He won’t eat chinese and she won’t eat thighs. How would it work with breast meat? He could always have pulled pork that night. Have you tried using the Donabe for pot in pot cooking – with the donabe inside the instant pot? I just bought an inexpensive one and want to try it. Thank you for this recipe. I will try tomorrow. But I have a question. Isn’t 2.5 cups of broth / water really 20 ounces, and that the 24 ounces you suggested really goes for 3 cups? If possible, let me know so that I make sure I have my proportions correct between water and rice. Thanks! I made this tonight with a few changes due to lack of some ingredients. Turned out very good. Thanks for the times/temps and info. I have a family of 8 and an 8 qt Instant Pot. If I double the recipe, do I need to adjust the cooking time? Another great dish. I added onion and garlic.Super flavorful!